A lot of people probably already know this, but oils are fabulous. Even when you have oily skin. They are great for balancing your sebum production, and delivering hydration to your skin. They are a great anti-ageing product, and they also do wonders for you when you take them orally. This first oil is actually a treatment for your tresses, and a really good one at that! It contains argan oil, and utilises a kind of technology that helps deliver that argan oil into your hair, instead of just having it sit on top of it, meaning your hair won't be weighed down, nor will it feel greasy. This makes it the perfect product for any kind of hair, from thin, flat hair to thick, coarse hair. It works beautifully on both non-treated and treated hair. Simply pump a few drops into the palm of your hand, rub your hands together, and disperse the product all over your hair. To help disperse the oil more evenly, brush your hair through after. It has been working absolute wonders on my newly coloured hair, and I bet it will on yours, too. Jojoba oil is special, in that the jojoba plant is the only plant that can produce wax esters similar to those found in our skin (sebum). Our skin's natural wax esters are responsible for keeping the skin hydrated, plump and most importantly, firm. Our production of these esters starts to decrease as we progress into our 20s, and that is where the Jojoba Company's oil comes in. I like it because it absorbs into my skin almost instantly, without leaving that greasy feeling behind on the skin. It has been doing a great job at hydrating my skin too, no grease but plenty of smoothness and plumpness to my skin. Kosmea is well known for their rose hip oil, which is high in antioxidants, vitamin A, and essential fatty acids. This means that it helps your skin cells regenerate faster, prevents premature ageing caused by exposure to the sun, and helps to reduce the appearance of burns, scars and wrinkles, among other things. This new offering from Kosmea adds the antioxidant benefits of berry oils, and is great when applied to your skin when you're fresh out of the shower (this oil works best when applied to damp skin). Honestly, I am very tempted to start slathering this onto the skin on my arms and legs as well, and I think I just might! 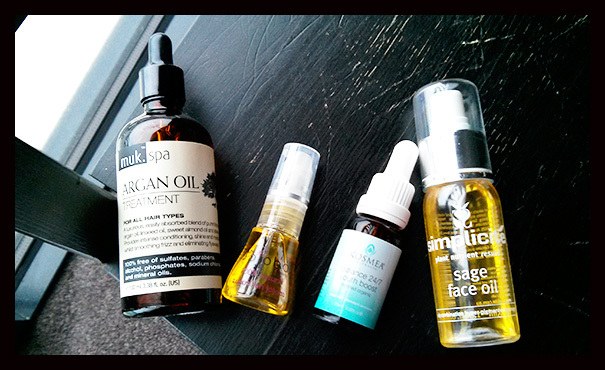 You all know that I am a huge fan of Simplicite products, and this Sage Face Oil is one of my favourites. It is quite heavy and does feel greasy on the skin*, but I am more than willing to leave my skin feeling a little bit greasy for all the benefits that this one face oil offers. It helps to prevent the formation of blackheads and pimples because of its antibacterial qualities, and helps the sebum on your skin 'move around' so that it doesn't clog your pores. The fantastic thing about this oil is that it is also formulated to help reduce the appearance of hyper-pigmentation, so it is absolutely fabulous for acne-prone skin. * Robin from Simplicite has come back to me about this, and has told me that your skin is not meant to feel greasy when you apply the Simplicite Sage Face Oil. To avoid feeling greasy, apply the oil on top of Simplicite's Floral Toning Spray, or mix the spray and the oil together in your palms before applying to your skin, and it shouldn't feel greasy.